Christopher Harrison was born circa 1780, to an affluent family in Cambridge, Maryland and graduated from St. John’s College. Afterwards, as he began to study law, he went to work, clerking, for the president of the Bank of Baltimore and soon began tutoring the bank president’s daughter, Elizabeth Patterson. Over time Christopher and Elizabeth became romantically involved and even though her father did not approve of their relationship, she had secretly promised Christopher that she would marry him. However, in 1803, Elizabeth was introduced to Jerome Bonaparte, Napoleon’s younger brother, and the two fell instantly in love. The couple quickly married and left Christopher publicly spurned and heartbroken. To escape his melancholy and feelings of public shame, Christopher soon left Maryland and headed for the unsettled wilderness of the Indiana Territory. He arrived sometime in 1807 and built a tiny one room cabin overlooking the Ohio River, in what today is Hanover, Indiana. Here he led a very reclusive life, with only a faithful dog as a companion, spending most of his time reading and painting, which he had a great talent for. Christopher maintained his hermit lifestyle for close to 6 years, but as more and more settlers’ arrived in the area, he returned to being sociable. However, it is said during his time of seclusion that he became a close confidant and advisor to William Henry Harrison and one of his earliest connections was with 1 of the 3 men who, in 1809, founded the town of Madison, IN., Jonathan Lyon. Jonathan was an industrious man, who helped start the first ferry system across the Ohio River, from Indiana to Kentucky and had several other business and land investments. These two men became quick friends and Mr. Lyon was soon convincing Christopher Harrison to enter into business investments with him. 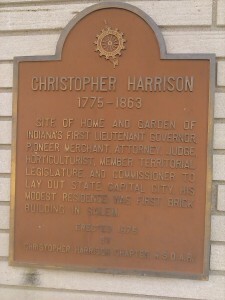 This led Christopher to being one of the founding investors of the Farmers and Mechanics Bank of Madison, in 1814, one of the first two banks in the Indiana Territory. Later in the same year of 1814, Jonathan Lyon and Christopher Harrison, rode on horseback to the new town of Salem, where General John DePauw had just laid off the Public Square and the two men purchased several lots. In early 1815, they had their lots cleared, along the north section of the west side of the square, the men invested together to build a long two-story log cabin, where they opened the second general store in the town. On the west section of the north side, Mr. Lyon constructed one of the first two-story frame houses in the county and on the corner of the east section, of the north side, on Lot #11, Christopher Harrison built the first brick home in Salem. Harrison had left two of the old giant forest trees on his lot for shade and added, what can only be imagined from all of the glowing adjectives used in the historical recollections of it, as a remarkable flower garden in front of his home. Along the railings of his front porch, Christopher painted a series of leafy, flowering vines, which were said to be so incredibly good, they were often mistaken for being real and at times people would literally reach out to touch the vines to test for themselves. Nearly every historical account of Harrison’s little home describes it as the most beautiful in the new town. Christopher Harrison quickly became a highly respected and influential man in the territory, for his intellect, refinement and artistic abilities. He was said to have remained mainly businesslike in his social affairs and for the most part, reclusive in his private life, with the exception of his deep adoration of the town’s children. He was known to frequently present young girls with beautiful bouquets of flowers, from his garden, or little hand paintings, he had made especially for them. He also grew a variety of melons, on a small farm he had purchased, just east of town, which he would artistically carve the names of boys and girls of Salem into the rinds and present them as gifts to the kids. Harrison was also well known as a man of many moods and was said to have frequently dropped into a deep depression, completely cutting himself off from even casual conversation or acknowledging the existence of those around him. Today, he would most likely be clinically diagnosed with some type of depressive mood disorder or as bi-polar and medicated to cope with it, but psychiatric understanding was still uncharted territory in Harrison’s times. Christopher’s first public service in Salem was to draft 3 maps of Washington County, on a scale of one-half inch per square mile, the first officially produced and additional accounts state that he made the first plat map of the town. He also reportedly served one term, or a partial term, as a Washington County Circuit Court Judge. Once in the political arena, his reputation and popularity ascended so quickly he was elected Lieutenant Governor in the state’s first elections, serving with Governor Jonathon Jennings. On December 3, 1817, Lt. Governor Christopher Harrison and General Marston G. Clark, traveled to Corydon, representing Salem’s Masonic Lodge, to meet with delegates from the other 8 established lodges, in the young state, to organize the Grand Lodge of Indiana. In 1818, Jonathon Jennings was appointed to a federal commission, along with Salem’s Judge Benjamin Parke, to negotiate additional land treaties with some of the Indians residing in our state. Harrison was made the acting governor in Jennings absence. Upon the delegation’s return, Harrison refused to relinquish the governorship, claiming Jennings had violated the state constitution and was no longer eligible to hold the position. The constitution, did in fact, forbid any member of the state government to hold a position with the federal government at the same time. So Harrison filed impeachment papers against Jennings, seized the Indiana State Seal, and attempted running the state from his own governor’s office. In the 1819 elections, Harrison ran against Jennings for governor, but he was soundly defeated. Jennings remained civil with Harrison and Harrison remained influential and active in the Indiana political ring. By 1820, it was decided the state capitol should be relocated from Corydon, to a more central location in the state and the site of Indianapolis was chosen. In January of 1821, Jennings appointed Christopher Harrison and two other men, as commissioners to lay off the town. Harrison was the only member of the commission to arrive at the site on the stated date and quickly decided he formed a majority of the commission present, so he voted to go ahead and start laying out the town. Harrison selected Alexander Ralston and Elias Fordham as surveyors, Ralston had previously assisted Major L’Enfant, to survey and layout Washington D.C. Ralston was obviously heavily influenced by L’Enfant’s design, as he laid out Indianapolis in similar style, with a circle in the center and streets and avenues radiating outwards. Christopher was very much a free thinker and seemingly enjoyed his quiet, solitary life in Salem. He could frequently be found, in the evenings, sitting on his front porch, reading and if he wasn’t in the midst of one of his depressive episodes, would be quite genial and pleasant to passers by. He was not specifically affiliated with any particular religion while he lived in Salem, but he felt a kinship with the Quakers and would frequently ride out to the old Blue River Friends Meeting House, (celebrating its bicentennial this year! ), with Judge Benjamin Parke, for services. Harrison gained considerable notoriety for his artistic abilities and created many works, including portraits of several notable Hoosiers, of his day. Despite recent reports of his art being on display within the state, it is a great mystery what happened to the works of Christopher Harrison, to the Indiana Historical Society and the Indiana State Museum, and no known public examples have been found to date. Sometime after his father passed away, in 1802, Harrison had inherited his dad’s considerable land interest, along with the family’s plantation and their slaves, back in Maryland. In January of 1834, for unknown reasons, Christopher sold his real estate in Salem and returned to his native home, where he at once freed the family’s slaves. In 1840, he officially joined a Quaker church, near Cambridge. The life long bachelor, Harrison died in 1868, at the age of 88, in Talbot County, Maryland. 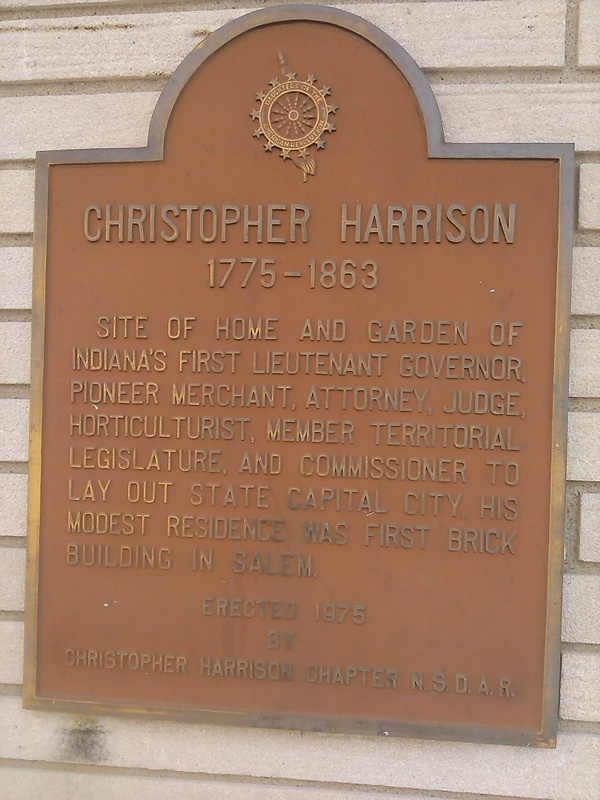 Salem’s local Daughters of the American Revolution chapter is named in Christopher Harrison’s memory and in 1975, they placed a plaque on the north side of the Regions Bank, at 24 Public Square, marking the site of Harrison’s pioneer home.